Former Yankees pitcher Chien-Ming Wang signed a minor league deal with the Royals, making that the eighth organization (ninth if you count a short stint in indy ball) the right-hander has been a part of since returning to pitching in 2011. After tearing his shoulder capsule during the 2009 season, Wang missed all of 2010 to recover and the Washington Nationals picked him up in hopes of getting the pitcher he once was for such a short amount of time. He last pitched in the big leagues during the 2013 season for the Toronto Blue Jays and it was a disaster, but it wasn’t always that way. Signed as an amateur free agent by the Yankees in 2000, he made his professional debut at the age of 20. After missing the 2001 season to injury, it took him another four seasons to reach the majors. He wasn’t expected to be a star, but somehow he managed to turn into one, albeit not a very famous one. In 2005, he managed to pitch at an above-average level while the rotation fell apart around him. That year, Carl Pavano, Jared Wright, Kevin Brown, all broke down during the course of the season. Wang was hurt too, but he returned late in the second half and was even able to pitch in a playoff game. His first year was solid, but maybe not much to remember. What followed, though, were probably two of the most important seasons for the Yankees in that decade. Between 2006 and 2007, Wang pitched to a 3.67 ERA and a 3.85 FIP over 417.1 innings, averaging somewhere between six and seven innings per start–something the current Yankees would love to dream on. He led the league with 19 wins in 2006, was the runner-up in the Cy Young vote to Johan Santana, and placed 24th in the AL MVP vote. His numbers weren’t the most dominating–a 3.9 K/9 rate over that time would attest to that–but his power sinker made him a real threat to hitters with a ground ball rate over 60%. Some of his best games in 2006 include his two-hit, two-walk, complete game shutout of the Tampa Bay Devil Rays. There was also a game where he produced a total of 20 ground balls outs in a single game against the Atlanta Braves. He even struck out 10 batters in 2007 on his way to complete game while allowing just two runs against the New York Mets. It seemed like he was always going into the seventh, eighth, or ninth inning with less than 100 pitches. Everyone was so focused on the strikeout that they never realized that contact could be such an effective means to utterly dominate your opponent. It’s a pity he had the literal worst defense in baseball playing behind him from 2005-2007, because who knows what things would have been like if they had even a league-average group then. He ended up being worth 7.5 WAR over those two years, ranking right next to Mussina and Andy Pettitte during that period. He was top-20 in innings pitched, ranked third in ground ball percentage behind only Derek Lowe and Brandon Webb, and his 2.40 BB/9 was just outside of top 20 in baseball at the time. Wang was never the best, but when the Yankees needed him most, he was at least one of them. At a time when the Yankees were paying Carl Pavano not to pitch and had a disappointing two years with Randy Johnson, Wang filled in at the league minimum. He was invaluable. The most exciting thing about it was that he arrived on the brink of a new day. He came up at a time where the Yankees were still filled with bloated contracts for underperforming veterans and his presence was a breath of fresh air. He made his debut just as Robinson Cano was entering the league and Melky Cabrera was getting a chance. Joe Torre was finally on his way out after a decade in the dugout. Pretty soon there would be Phil Hughes and Joba Chamberlain, and though we have the benefit of hindsight to know how terrible that all worked out in the end, Wang was there before it was cool to be young and he was great. Unfortunately not everything worked out as expected. As much promise as the 2007 season brought, 2008 proved to be the cruel reality check that none of us wanted. Hughes and Joba got hurt, and Wang, while rounding the bases in Houston, tore a ligament in his foot and a muscle in his leg to end his season in June. All these injuries and disappointing seasons likely led the Yankees to go heavy on that year’s free agent class, coming away with CC Sabathia and AJ Burnett to nail down their weakened and underperforming rotation. Many believe that Wang’s injury threw him off and he struggled in his return during the 2009 season before ultimately tearing his shoulder capsule and destroying the Wang we all knew. I’ve written about Wang before, I even asked him to retire and put an end to the ghost that he has become because it was just too painful to watch. He’s a member of the Pinstripe Alley Top 100 Yankees and he has a legacy in the Bronx that won’t go away with time. It’s just incredibly weird to think that you’ve peaked doing your life’s work before the age of 30 and it’s not really anyone’s fault. You can’t even say he just didn’t work out–he got hurt. Situations like this ruin–even end–people’s lives. I’m a few years away from 30 and would like to think that I haven’t come close to my peak, but if I knew it had already come and gone, I have no idea how I’d be able to keep doing what I was doing. Then you look at what Wang has been doing and maybe it isn’t sad to see a 35-year-old man–already gone from the man he once was–continue to plug along. He made it once, he could make it again, but even if he doesn’t maybe there is something to look at, maybe even emulate, in Wang’s determination to do the only thing he very well might be good at. There’s no shame in that and if he pitches another 10 years, even if it’s at the Triple-A level, we should all be so lucky. In the meantime, I’ll remember who Wang was, but never ignore who he has become. Jason Cohen is an editor at SB Nation’s Pinstripe Alley where he holds the world record for most articles written and it isn’t even close. He is an unapologetic Yankees fan who loves bat flips, calling people out when they say something offensive, and isn’t quite comfortable talking about himself in the third person. You can normally see his writing at Pinstripealley.com and his tweets at @Jason00Cohen. Sometimes, baseball plays a role in a piece of fiction, but not really a big enough one where I can do a full piece on it. Take Marvel, for example. 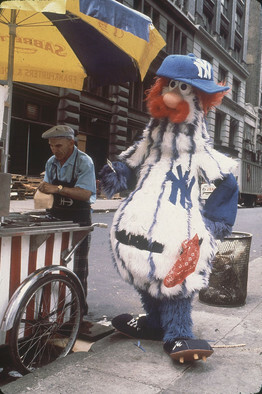 The fact that 95% of their heroes are in New York City means that there are plenty of stories where heroes or villains visit Yankee Stadium but where their visit isn’t long enough or baseball-focused enough to really justify giving them the full Bizarre Baseball Culture treatment. We all feared this day would come. We told ourselves it was just a bad dream, a prophecy that would never be fulfilled. But, alas, that bleak day happened. Alex Rodriguez, baseball’s greatest monster, arrived at Yankee Spring Training on Monday, coming days early by way of an ominous Zeppelin of Doom, powered by the tears of orphans and the death-cries of starved kittens. After all, that is what Alex Rodriguez is all about. Himself. Some would move with the flow, be one with the team. But not Alex Rodriguez. Everything about him is looking out for number one. And yet, he is one of the ones who he has failed, right alongside his family, his team, his sport, America, and, indeed, all of mankind. And, yet, he doesn’t even seem to know what, exactly, he has done wrong. Not today, not yesterday, not ever. ARod just spoke. Said he cringes at some of the mistakes he’s made. But he would not elaborate on what they were. Oh, and he said that while drinking the blood of a hapless victim. But that’s now important: he wouldn’t elaborate. Selling the rights to the X-Men and Fantastic Four to FOX Studios, thus depriving the world of seeing The Hulk fight The Thing and Wolverine hanging out with Captain America during WWII. That’s a lot of potential things you could have possibly done, and the fact that most of them you had nothing to do with has nothing to do with that, A-Rod. You are a disgrace, a fraud, and a poo-poo head. Please go away. Wolverine of the X-Men has a habit of appearing in comics he technically isn’t supposed to be in, simply because he’s popular. Well, Cal Ripken is the Wolverine of Baseball Comic Books. He’s joined forces with Batman, led the Shortstop Squad, and been the subject of a bio-comic. Also, like Wolverine, Cal Ripken seemed to be able to recover from any injury, no matter how severe. But, it’s the first similarity that I’m focusing on, because, in the comic I will be looking at today, Cal Ripken appears in a story about the 2001 New York Yankees being Superheroes. Let that sink in. The New York Yankees, in a comic that they themselves ordered and gave away, still had Cal Ripken in their comic and had him on the cover too. Entitled “Championship Challenge” and given out September 28, 2001, it stars, as you can see, four of the greatest stars the Yankees had that season. Mariano Rivera! Tino Martinez! Jorge Posada! And, of course, the Once and Future Captain, Derek Jeter himself. But, of course, we also see Cal RIpken on the cover, letting everybody know that the Iron Man will be there! 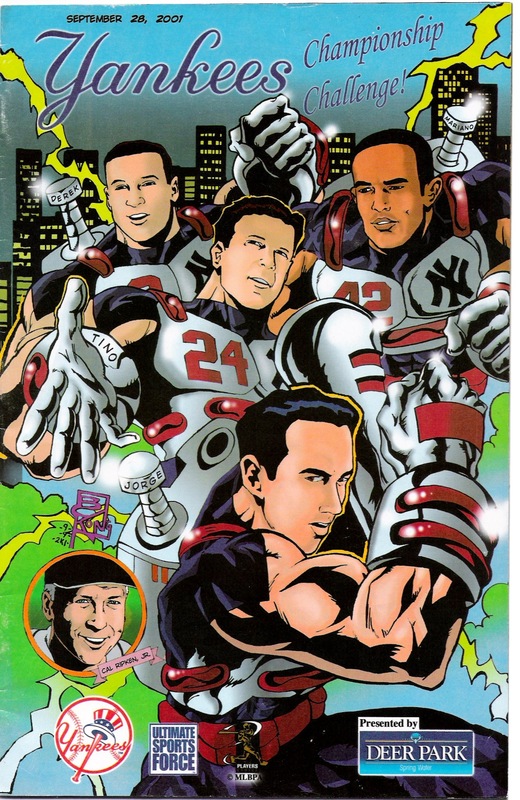 With such Ultimate Sports Force stalwarts as Rick Licht writing and Brian Kong doing the art, this was partially made as part of the Ripken farewell celebration, and it becomes even more obvious when you realize that originally Ripken’s final series would have been at Yankee Stadium if not for the schedule reshuffling that MLB did after the 9/11 attacks. Shortstop Squad, in which Derek Jeter joins forces with Cal Ripken, Barry Larkin, and Alex Rodriguez to fight a giant monster. And, over at Hall of Very Good, my wake for the Captain of the Yankees. But, that isn’t it! Because later this week, I bring you a Bizarre Baseball Culture that features Jeter! Get psyched! The word “apocalypse” does not, technically, mean the end of the world. It instead means “uncovering” or the revelation of something. In that truest sense, the New York Yankees have set themselves up for an apocalyptic year in 2014. Because with the signing of Masahiro Tanaka, they have turned their back on any semblance of the financial restraint they showed last year in a quest to possibly get under the luxury tax and are going with the good old fashion weapon of the Yankees of old: money. Lots and lots of money. Problem is, with the team that that money has bought, it has yet to be uncovered whether that’s going to do it anymore… at least the way the Yankees did it this offseason. The 1998 Orioles average age was 33.3 years old, their most common batting orders had no players that were younger than 30 at the end of the season, and of the eight pitchers that would start 10 or more games that year, only two of them were under 30. The “Jurassic Park at Camden Yards” Orioles underachieved greatly, finishing 79-83, 4th in the AL East, and beginning the long string of under-.500 years that would last until 2012. Carter, Charlton and Guillen were all gone from the team by the end of the year (although Guillen, admittedly, had mainly been gotten as a backup infielder), while Drabek retired at year’s end. Signed Masahiro Tanaka, who will be 25 in the 2014 season. Other than Tanaka, the list looks shockingly like what the Orioles did- getting old all-stars. And, like the Orioles of 1998, the Yankees will likely have their line-up made up entirely of players older than 30-years old. Although, to be fair, the Yankees rotation is younger and I’d definitely take a 30-year-old McCann over a 33-year-old Lenny Webster or Chris Hoiles and a 30-year-old Ellsbury over a 34-year-old Brady Anderson. But still, you can’t help get this sinking feeling that maybe, just maybe, the Yankees money-hammer isn’t going to work this time, that the players they have acquired are too old and too injury prone to bring them to the promised land. Still, It’s not hard to see why the Yankees are doing this. After all, they missed the playoffs last year and were lucky to end up tied for third with the Orioles in the AL East. And, as that happened, their ratings and attendance plummeted, and probably would have been even lower if not for the attention the grand Mariano Rivera farewell tour got. So, what were they going to do? Just spend money on some younger and cheaper players? Let Tanaka go to the Cubs or Dodgers? Pfft. They wouldn’t let that happen, they are the Yankees. And, hey, the money approach has worked before, and it may well work again. And they better hope it does, because if it doesn’t, it could turn into a baseball apocalypse in the Bronx of a somewhat more dire kind.